Education plays an important role in shaping our future and success. Students and parents have become more vigilant and aware about choosing the right educational institute for them/their wards. Thanks to the rising awareness and easy access to the internet, people now check online, each and every detail about the institute they are interested in. Going to an educational institute means an investment of both time and money so today’s generation wants to make sure that it is inducted in the right place. Therefore, you will find almost all the institutes having their websites now to give full information about them. Today we have come up with 40 Education WordPress themes specially designed to keeping in mind the needs of the education industry. Please have a look. School is the first place where kids interact with the world and learn new things. These parents look for a perfect institution for quality education. 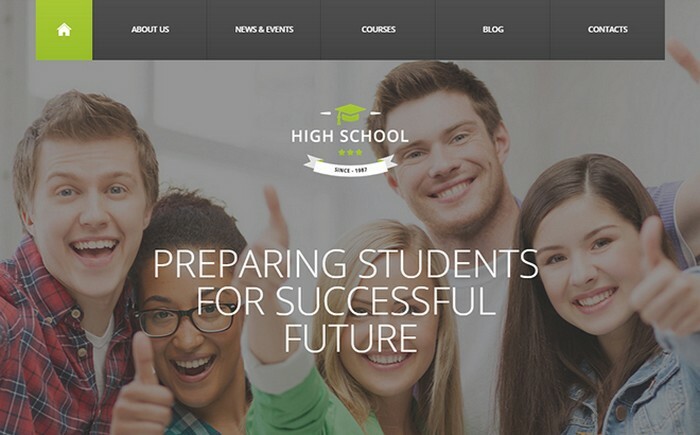 “School” WordPress theme is a responsive theme that lights up your school website with its clean and elegant layout. This theme can be used by schools, classes, daycares, and other educational programs. If you run a kindergarten, child care or nursery and you are passionate about your work, this theme is for you. “Little People” comes with an eye-catchy design, it has a visual composer, teachers introduction page, revolution slider, customizable grid, timetable plugin, testimonial management and much more. Whether you own a neighborhood elementary school or a world class university, this theme is one size fits all. 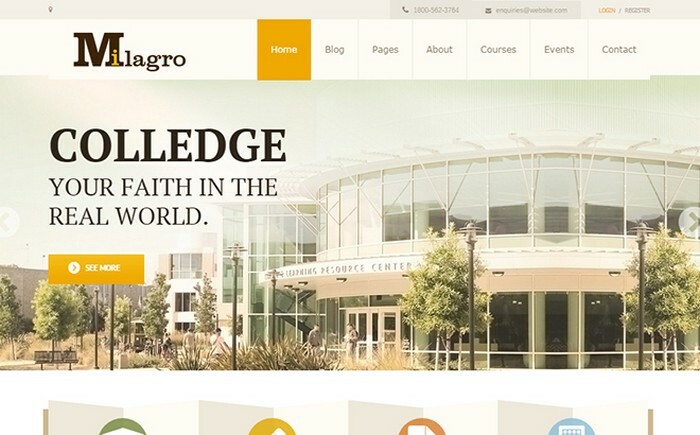 Education Center WordPress theme comes with 10 various Blog Styles, 3 Slider Styles, and Parallax effects to engross your audience thus bringing more admissions for you. 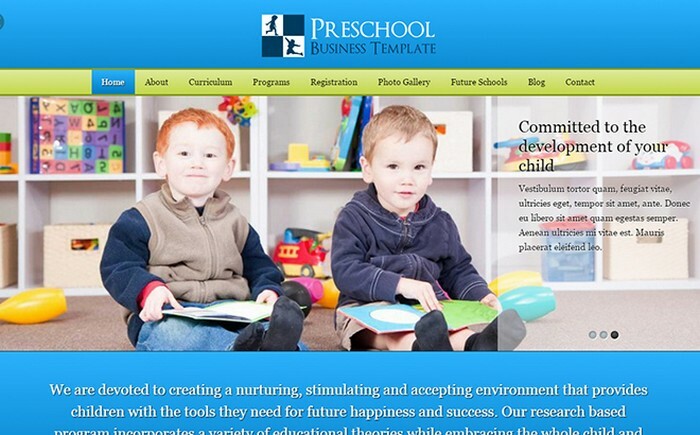 Preschool WordPress theme has the professional look yet it displays the fun and frolic nature of the preschools. You can experiment with a number of features and options to give your personal touch to your website. You can not only share your social media accounts but can also give your preschool program overview with informative detail pages, and share yearly calendar and images also. US School District is a perfect theme for the education industry. It is easy to use features like drop down menu, back to top button, advanced search options, Search engine ready, fantastic slider, filterable portfolio, unlimited fonts, colors, and tons more. It has been designed to display all information regarding your institute in the best possible manner. Milagro comes with an array of advanced options to make it one of the most desired theme. 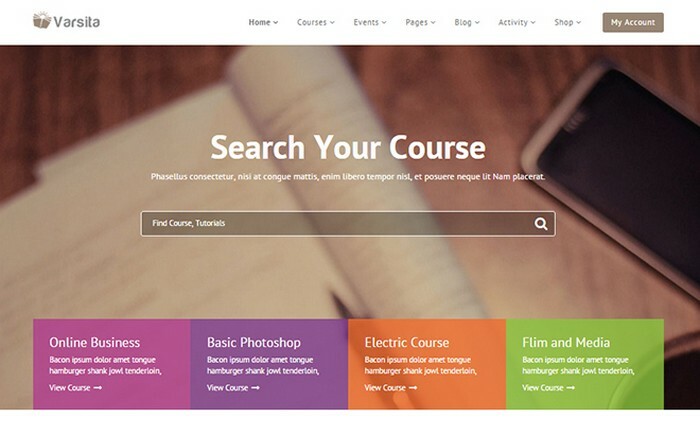 Whether you have an online portal, e-courses or even tutorial site, this theme can work wonders for you. What more, it is even woo-commerce integrated and one can make online payment through PayPal. 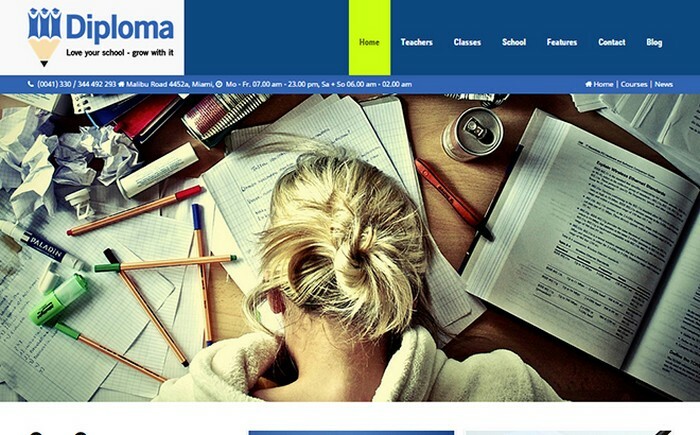 Diploma is an education theme that comes with one click install. It is a WooCommerce ready and is responsive so that your website look good on all device sizes. You can plan with colors, backgrounds, fonts etc and make your own masterpiece. 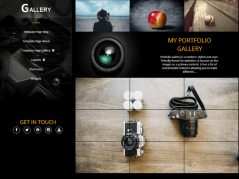 You also have choices of portfolios, sections, web fonts icons, slideshows and much more. 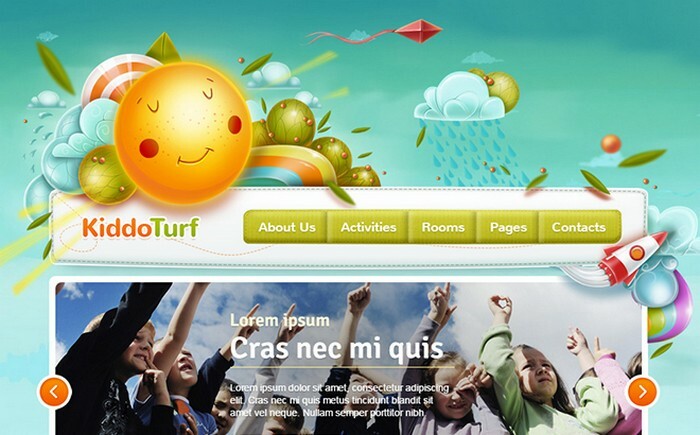 Kiddo Turf comes in vibrant colors and is adapt for a kindergarten website or agencies planning children activities. You can choose from a variety of page templates. You are also provided with various sliders, illustrations and layouts to make a site complementing your work style.It also has a regular default blog page. 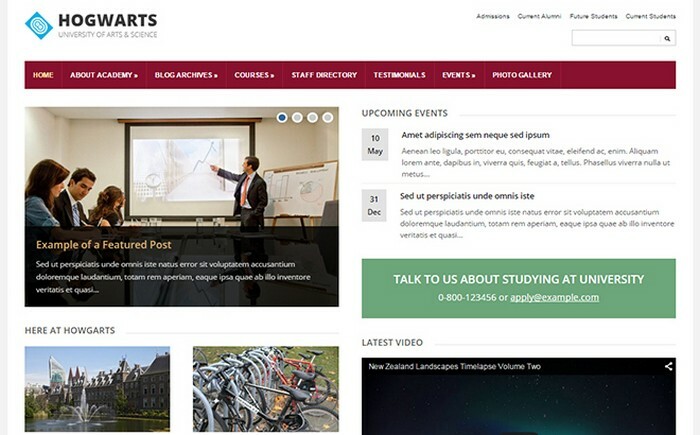 Buntington is an ultimate education WordPress theme. It has many inbuilt features so you don’t need to buy additional plugins for every little thing. It has been designed to give great user experience and its powerful admin options give you full control of your website. Crisp, clean and modern, this can pretty much sum up Georgia WordPress theme. It comes with easy but useful customization options and you can tweak it and add more color variations to give it a look to match your sensibilities. The navigation experience of users is also kept in mind and thus it has been made to systematically display all information. 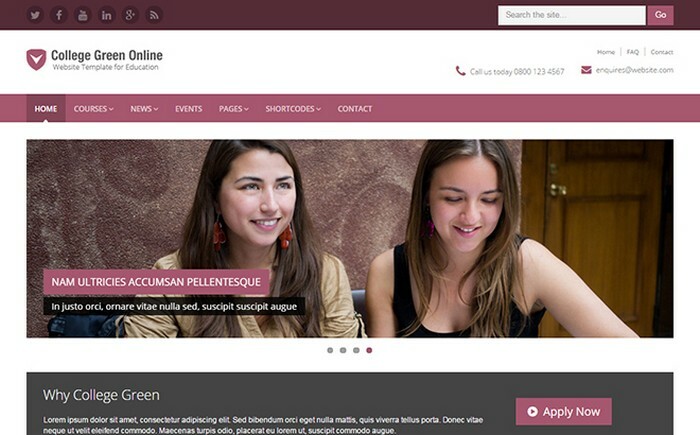 Academica Pro is a modern and professional theme that is best suited for schools, colleges, and universities. 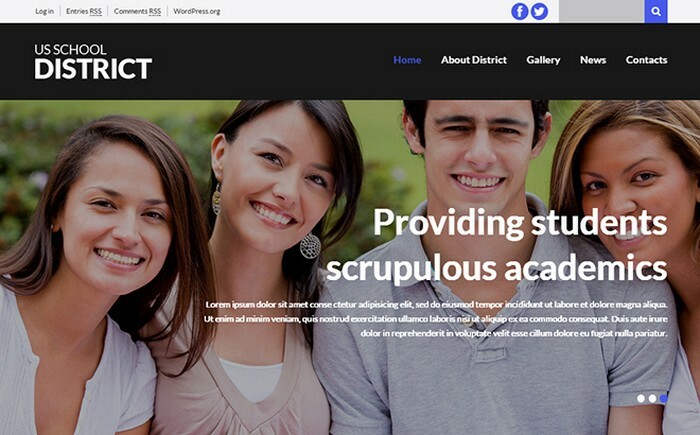 It has a highly customizable design and you can choose from numerous customization options to make your website look an ideal example of how an education institutes’ site should be. Invent comes with a visually appealing design perfect to meet needs of any educational hub. 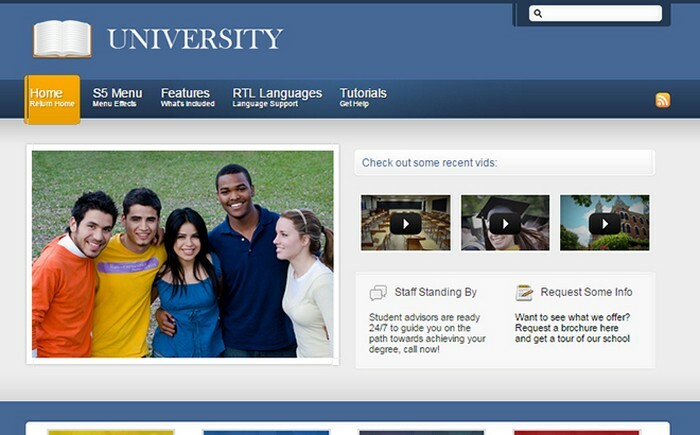 The USP of this theme is a video background where you can give a visual tour of your institute. It has a parallax/video sections, responsive design, choice of colors/fonts, and more than 200 options. 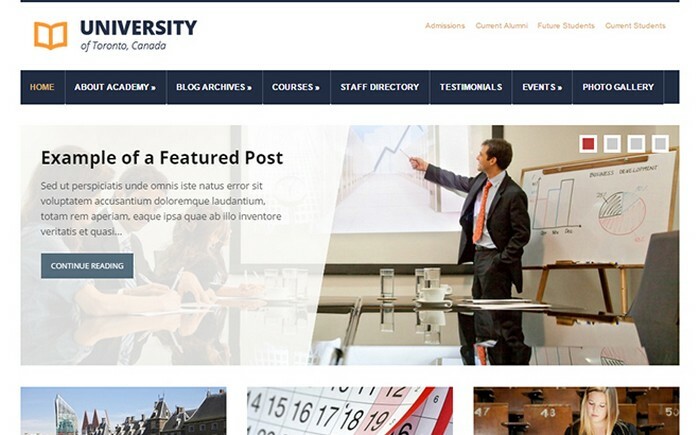 Reinvent your website with this beautifully crafted theme fit for all universities, colleges, schools, etc. It comes with an array of options, Slideshow on the homepage to display your image and video, custom widgets, post templates, menus and much more in its kitty. Hogwarts is an advanced WordPress theme studded with a two-columns responsive layout that support Videos too. The makers also provide free custom coding for an hour so that you can get it customized as per your needs. It is responsive and search engine optimized. If you are providing Secondary education, which is considered as one of the most important parts of the student’s life, you can mark a curve for your with this amazing theme. It has an impressive design and easy surfing options. Open a new world of opportunities with this awe-inspiring theme. It can be used by all sorts of educational websites and its features make your website running your website. It has a clean and responsive design. 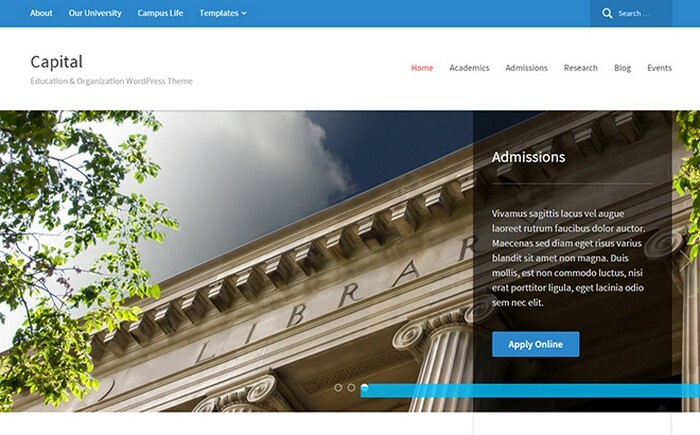 Reclaim your authority in your field and get more admissions with the help of this lovely theme. It is SEO ready and has a responsive theme so that you can reach vast number if the audience. It has a S5 MultiBox to display videos on the homepage. 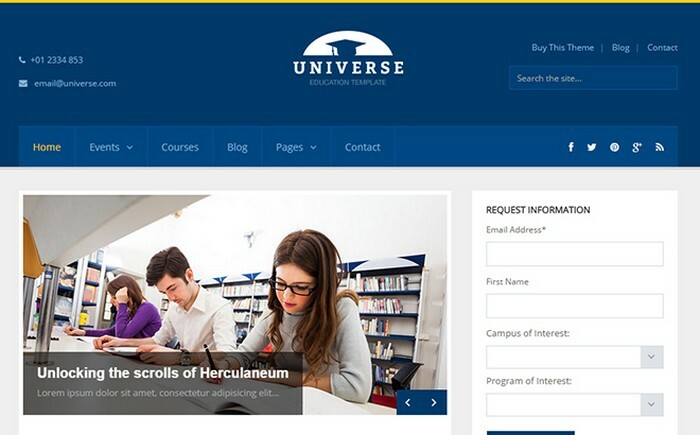 Make a strong online presence with this well-crafted theme made especially for universities and similar institutes. 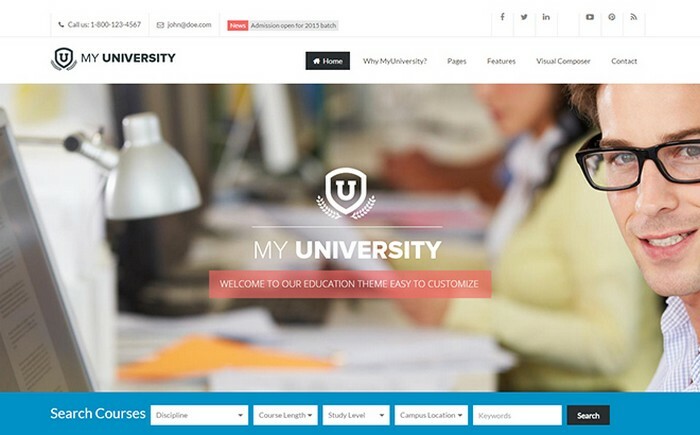 MyUniversity comes with a powerful set of features to make sure your website stands out. It comes with a premium slider, visual composer, advanced search options, SEO ready, predefined pages and much more. There is hardly any dull moment is students’ life and if you are the one providing ample space for students to rejuvenation activities along with studies, this theme shows you in the best light. 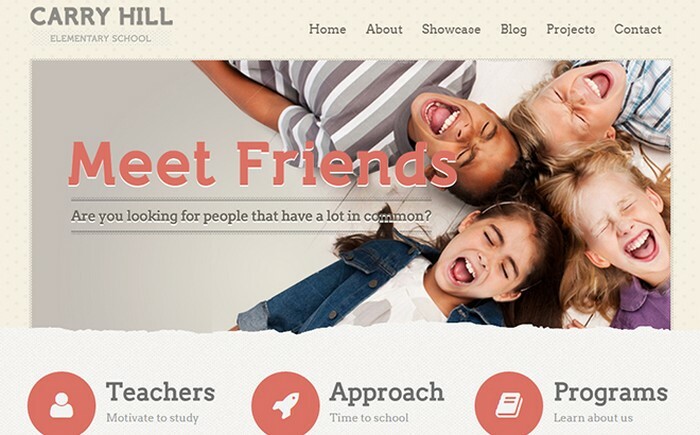 Carry Hill School is a well crafted WordPress Theme and it comes with a drag and drop page builder. It also has a premium slider, boxes and wide layouts and many more options. 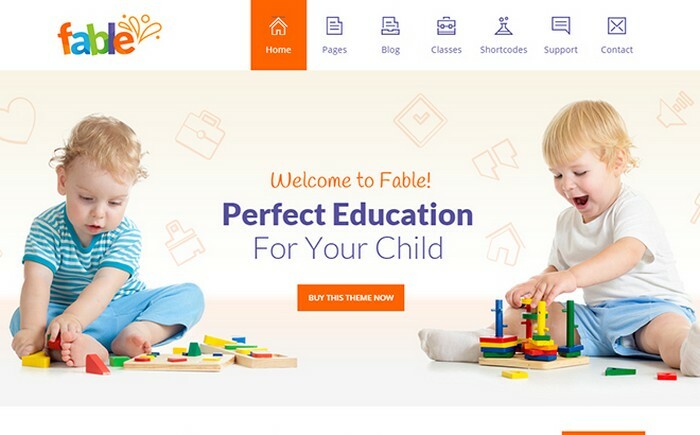 Fable lives up to its name with its elegant design and has an informative quality. It has been designed to adapt the screen size of all devices so that there is never a bad moment for your website. It comes with a drag and drop builder thus making it easy for you to create an awesome website in just a few minutes. 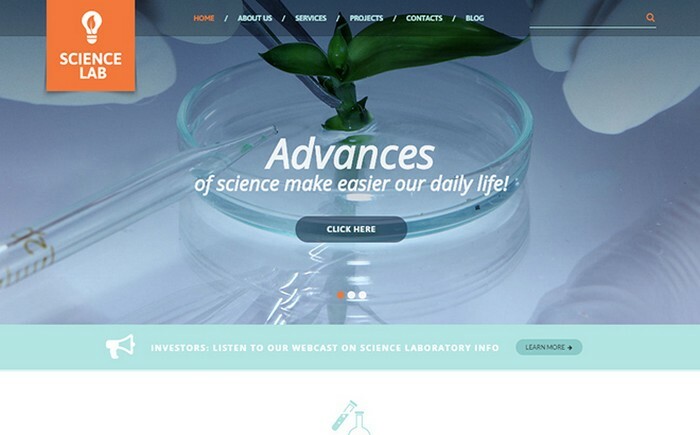 Science Lab WordPress theme is dedicated to Medicine Science. So if you are one of the researchers who is underway a discovery or a blogger keeping a tab on these undergoing discoveries, this theme is for you. It lets the world know about your work with this utility theme. If you are running a kindergarten, child care center, preschool, kids nursery, school, child school, daycares, preschools and related place, this theme can throw a new light on your work and achievements. It comes with a Build-In Drag and Drop Page Builder, Timetable, member management & class management, Shortcode Generator and much more. 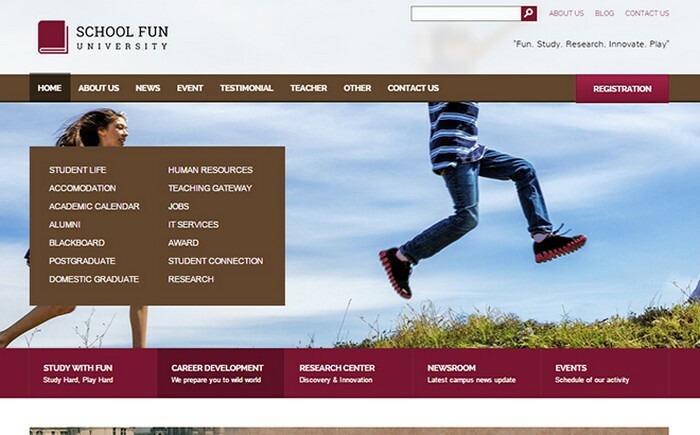 An education hub’s website does not mean that it has to be old school and boring. It can playful and yet strikes the right cord with the audience. 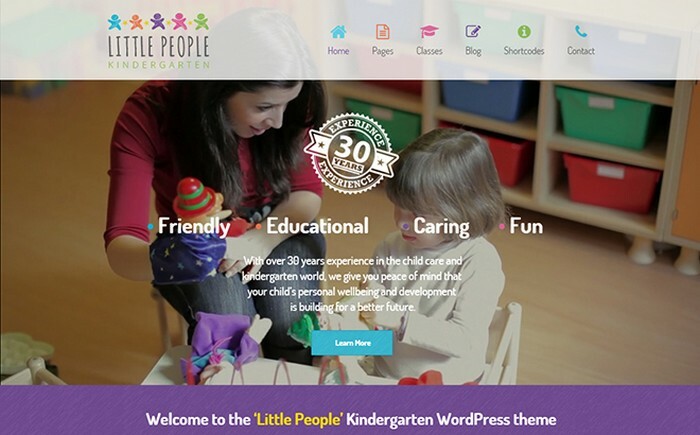 The Kindergarten WordPress Theme is one such theme.It displays all the information in a systematic manner, featuring the ones that require immediate attention. 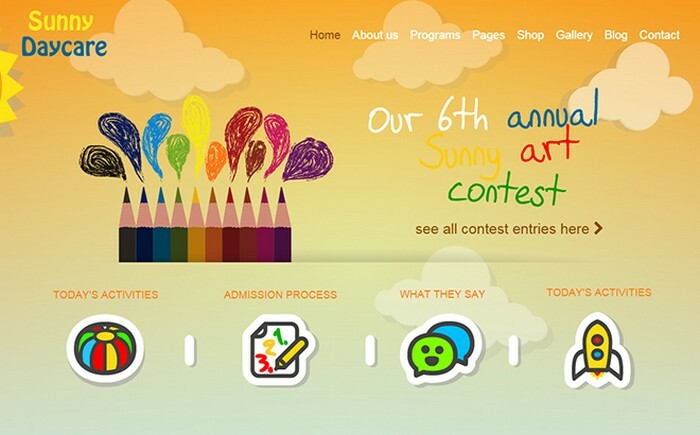 Schoolfun comes with features like custom post options, 3 Color Variations, Responsive & Retina Display Ready design, widgets, sticky header among others. It has a sticky header that will shrink and follow the browser movement. It is professional and has been kept simple and clean. 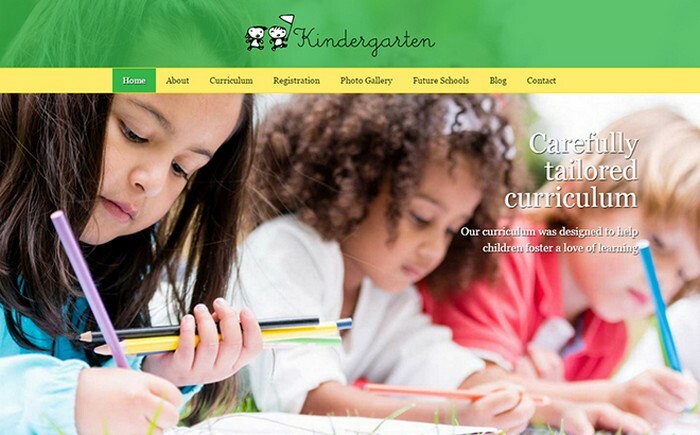 Hand Crafted kindergarten WordPress Theme for Daycare, preschool, children, art, craft, school, nursery, education, training & any kids website. Power packed with drag and drop page builder, tons of shortcodes, all in one theme options panel and covered with best in class support! 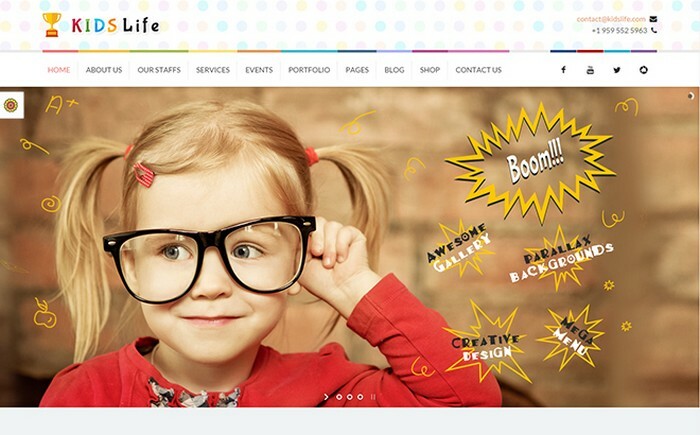 Lectura is a modern and playful WordPress theme that makes a perfect fit for an education site. It has a two-columns responsive layout. You can even post video tutorials and customize this theme to produce a site meeting your requirements. College Green has been designed to put all the focus on your institute and thus theme is simple and avoids any claustrophobic design. The makers experience in dealing with education themes is reflected in this theme too. You can choose from four colors to make the theme a perfect fit for your audience tastes and sensibilities. 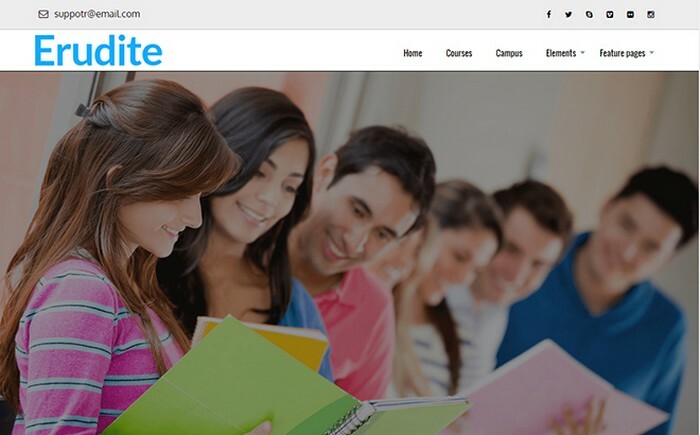 If you are looking for a complete Learning Management System theme, you have come to a right place. 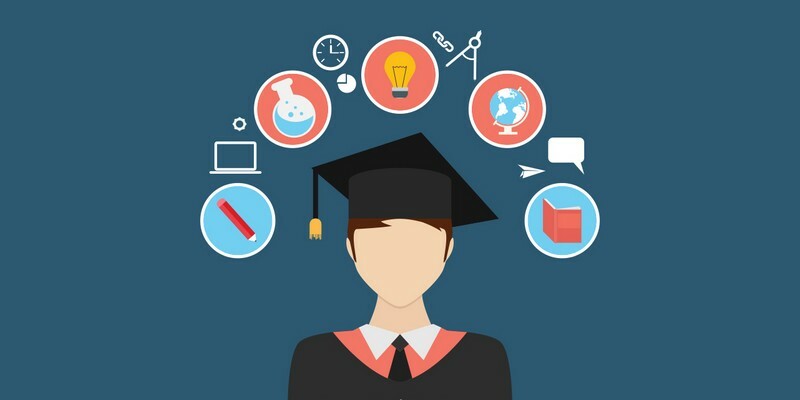 iKnow comes with a visually appealing design and makes your site e-commerce ready so that you can sell online courses and tutorials right from your website. It has a responsive layout. 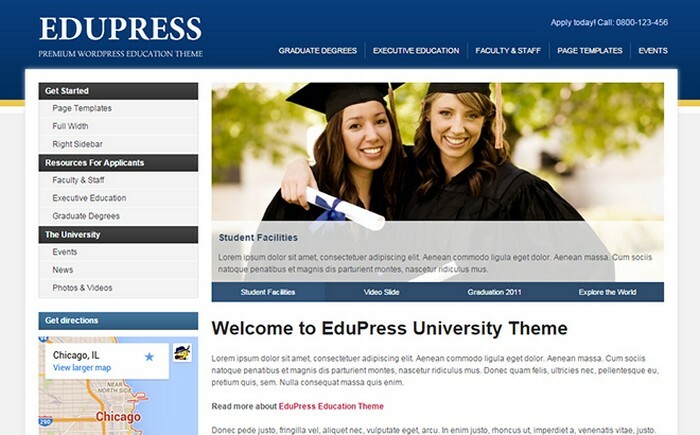 Erudite is a multi-purpose theme apt for any school/college/university website. It will revamp your website and make it more user-friendly. You can integrate your social media accounts here and pen new avenues for your business. It is both search engine optimized and adapts to the changing screen size. 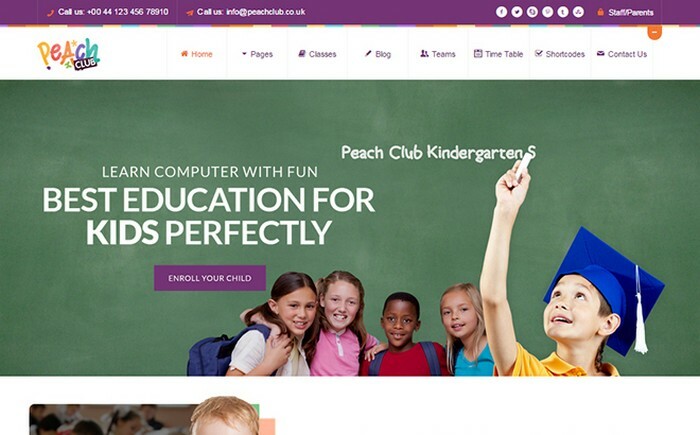 Schools make a strong foundation of children and this theme does exactly the same to your online presence. 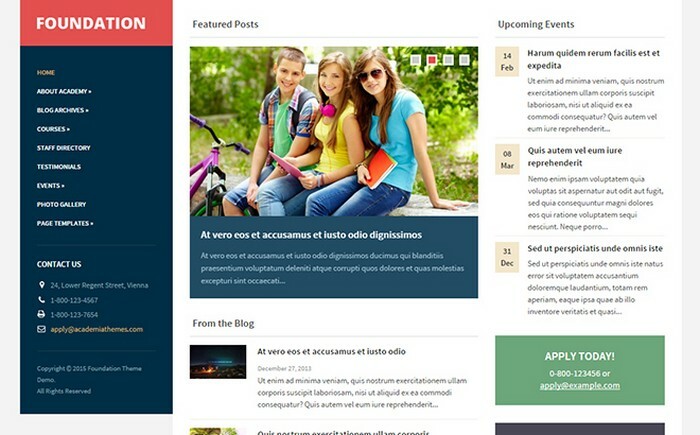 Foundation comes as an elegant modern theme supporting a three-columns responsive layout. You can share images and videos of your past events and achievements, choose from 4 built-in color styles, unlimited color variations, and many other customization options. Daycare is a perfect Children and education theme with unlimited customization possibilities. 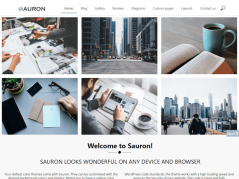 Whether you are looking for a single page website or want a multipage website to display all the information and experience you have, this theme fits the bill. You can also add a working contact form and newsletter, Visual Composer, and Wishlist plugin. 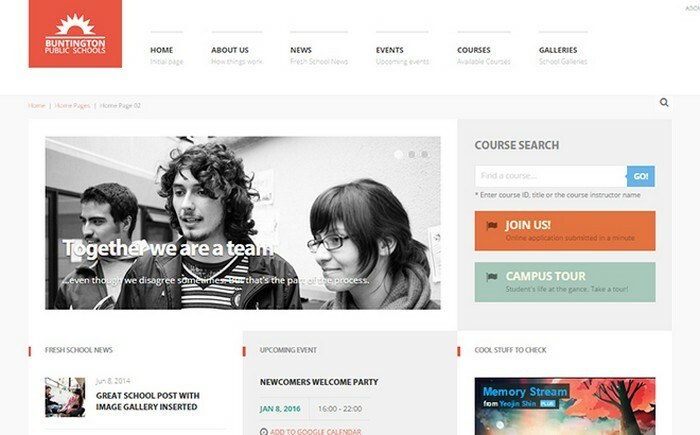 Checkout this clean and responsive theme if you are thinking of revamping your college/university website. It comes with an easy layout so that a non-technical person can also run the website without any hitches. It is also embedded with various features and plugins to make you manage your site professionally. 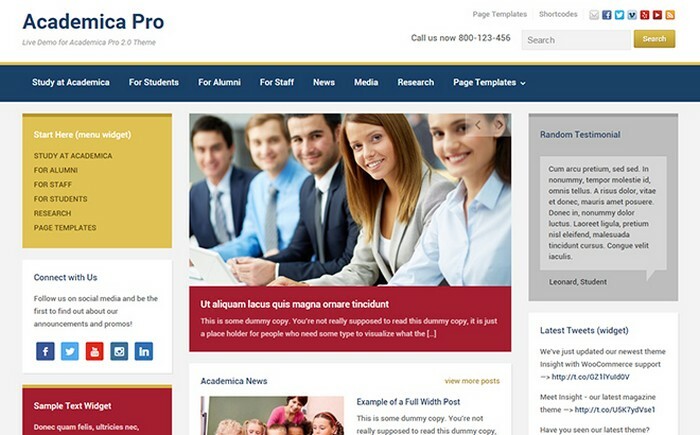 Education Pro is surely your pick if you are looking for a theme oozing elegance and comes with a professional touch. You can select from 6 layout options, various colors, customization option for menus, background, featured images and much more. it is easy to navigate so your audience will find searching and checking information an easy process. 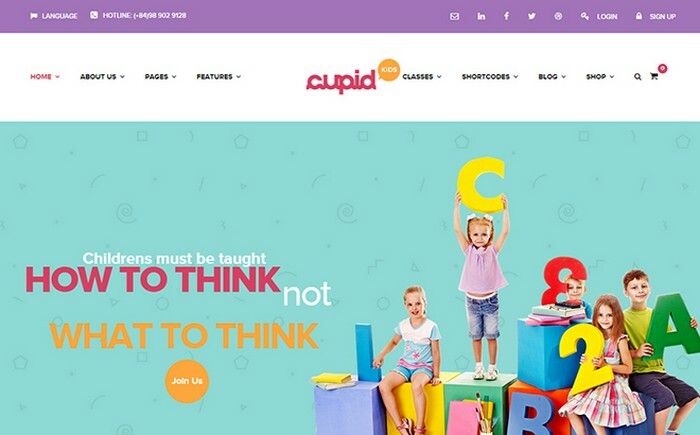 CUPID is a lovely education WordPress theme with awesome features to make a perfect kindergarten website for you. It has a strong admin panel and is pretty easy to use. It comes with one-click import pages, post, revolution slider, widgets, theme options and many other useful options. 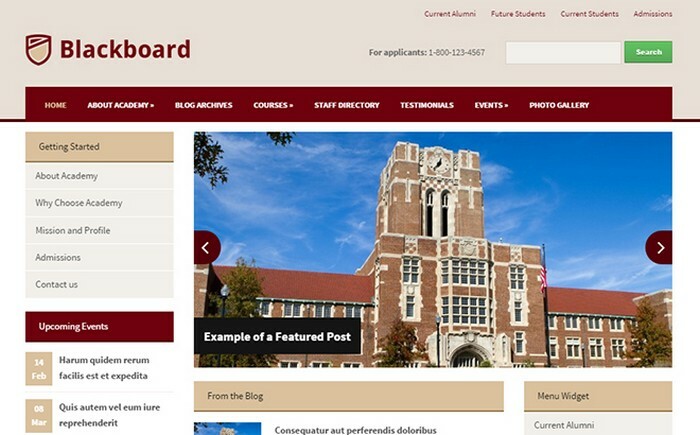 Blackboard is a modern WordPress theme with a three-columns responsive layout. Unlimited color variations and easy customization options make this a great theme for any organization. Themes include custom-built widgets for quicker display of Testimonials, Photo Galleries, Upcoming Events, etc. Capital comes with a responsive and retina ready design so that your website can adapt to any screen size. 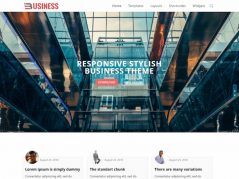 It is a Multi-purpose theme thus you can use it for any niche. It has a full-width slideshow and drag & drop builder. 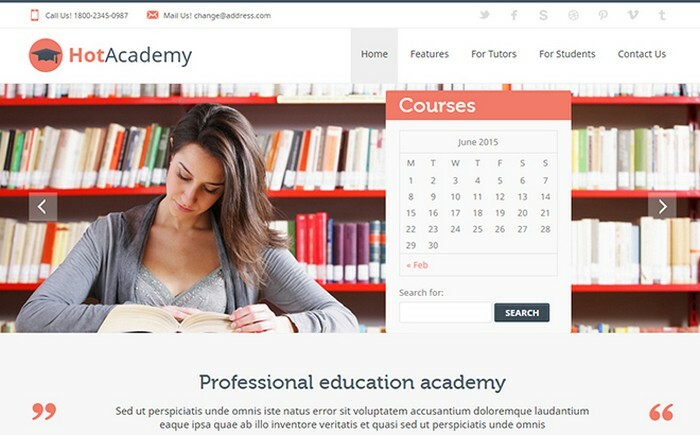 If you are running an online learning website and want to make it more user-friendly and make it a benchmark for other sites, this theme is for you. With the help of this theme, you can not only impart education online but can also monetize the entire process.So it is a win-win situation for both you and your audience. 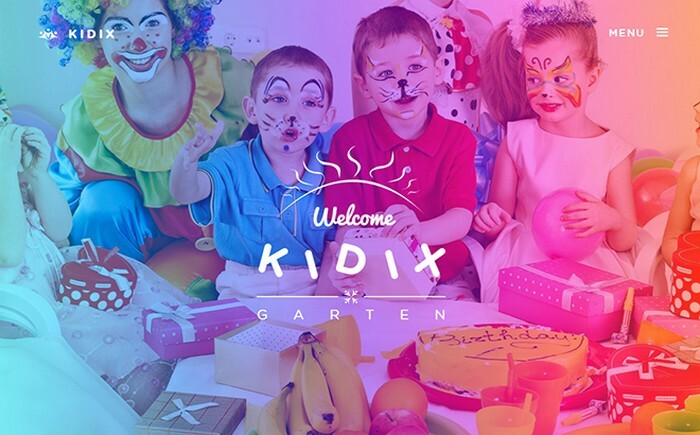 KIDIX is made especially for kindergartens and elementary schools, where the teachers use fun and frolic methods to impart education to the students. It is a responsive theme and it comes with a Visual Composer page builder so that you can see the changes in real-time. It also search engine optimized. 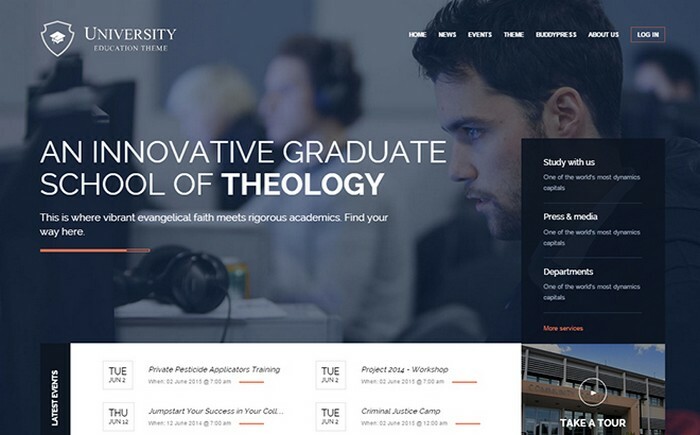 Academy theme makes an impact with its professional and easy on eyes design. It gives a nice overview of the academic activities planned in a particular month or an even for the whole year. 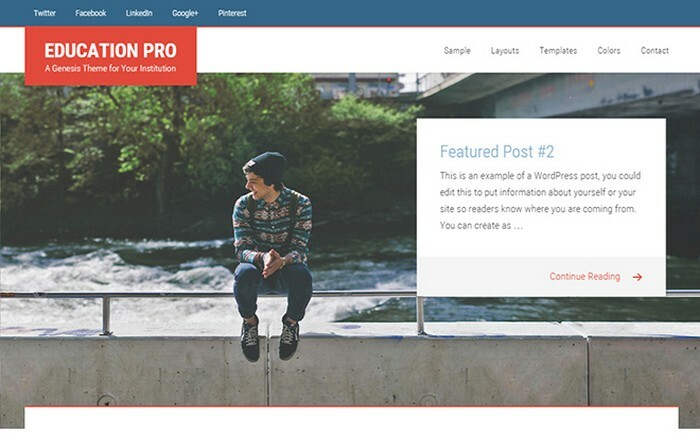 It is basically an education WordPress theme but with little tweaks here and there, it can also be used for other niches with equal ease. The key to a good school/college website is its ability to focus on the strengths of the university and to show all the important data in a systematic manner. 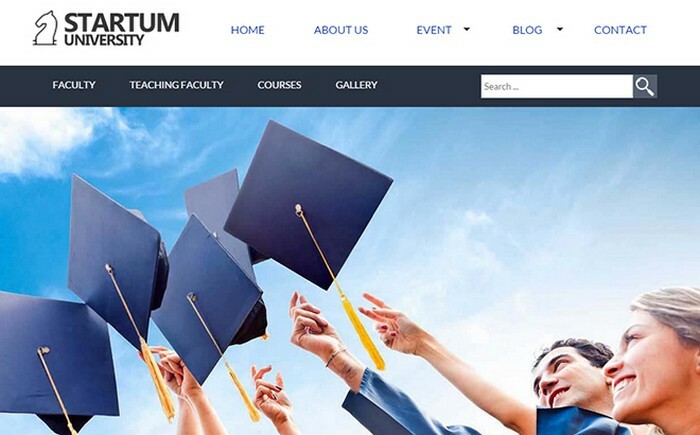 Startum University is one such theme that caters to the needs of the education industry. You can choose from colors, skins, widgets and many other options to make it a perfect fit for your institute.